Manga artists, professional illustrators and watercolourists use the pens to create precision lines. Scrapbook enthusiasts and crafters require its archival quality for preserving memories in journals, and for making cards, quilts and dolls. Use Pigma Micron to leave a mark that will last a lifetime. Learn more about Pigma Inks. The coloured Pigma Micron pens can be purchased below. 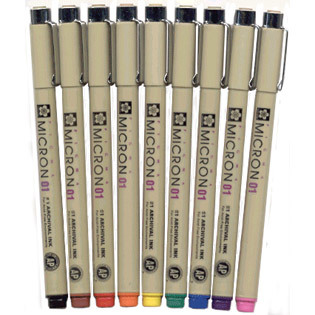 Click here for Black Micron pens in a range of nib sizes. Fabric design - the inks on fabrics are for "decorative purposes only" - meaning do not launder. Use on pre-laundered textile, 100% cotton. And most importantly, to pre-test on material scraps prior to final application. Value for money, good balance, flow of ink, colour and ease of use.